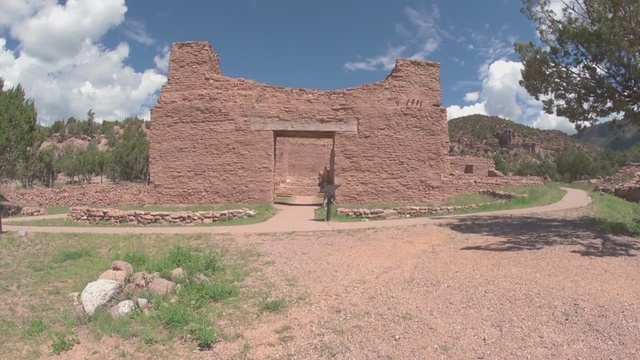 Of all the historic sites in New Mexico, few are as captivating and scenic as the Jemez Historic Site. Located in the quiet village of Jemez, the site has seen its fair share of triumph and tragedy over the centuries. Nestled in the Jemez Valley, sixty miles north of Albuquerque sits the ruins of the San Jose de los Jemez Church. The church was built in 1621. It was designed by a Spanish Friar and built by the native Pueblo Indians in the San Diego Canyon. This region of the southwestern United States, within New Mexico is believed to have been inhabited by indigenous people as far back as 2500 B.C. According to local historians, the original pueblo is likely to have been established around the 1300s, A.D., shortly after the migration from the Mesa Verde, Colorado area. The Spanish conquistadors chose this location in order to convert the large pueblo nation to Catholicism. However, the settlement and church was abandoned in the 1630's by the Spanish when the moved south towards the Jemez Village. By 1680, the time of the Pueblo revolt, the church's walls were torn down and its buildings were left in ruins. At the site today, native-built structures still exist and represent the buildings that people still use to this day: Kivas. People are welcomed and encouraged to visit and can even see and have an interactive experience with one of these buildings.